<b>Wipac Crystal Halogen Headlamp Conversion Kit (pair) - left hand dip (UK and Australia)</b><br> <br> These 7 inch diameter headlamps offer excellent lighting due to their clear lenses and profiled back reflector. Each pair of lamps come complete with 55w bulbs and are able to be fitted to all right hand drive Series 2/2a/3, Defender and Range Rover Classic models. 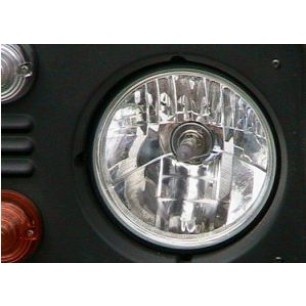 These 7 inch diameter headlamps offer excellent lighting due to their clear lenses and profiled back reflector. Each pair of lamps come complete with 55w bulbs and are able to be fitted to all right hand drive Series 2/2a/3, Defender and Range Rover Classic models.